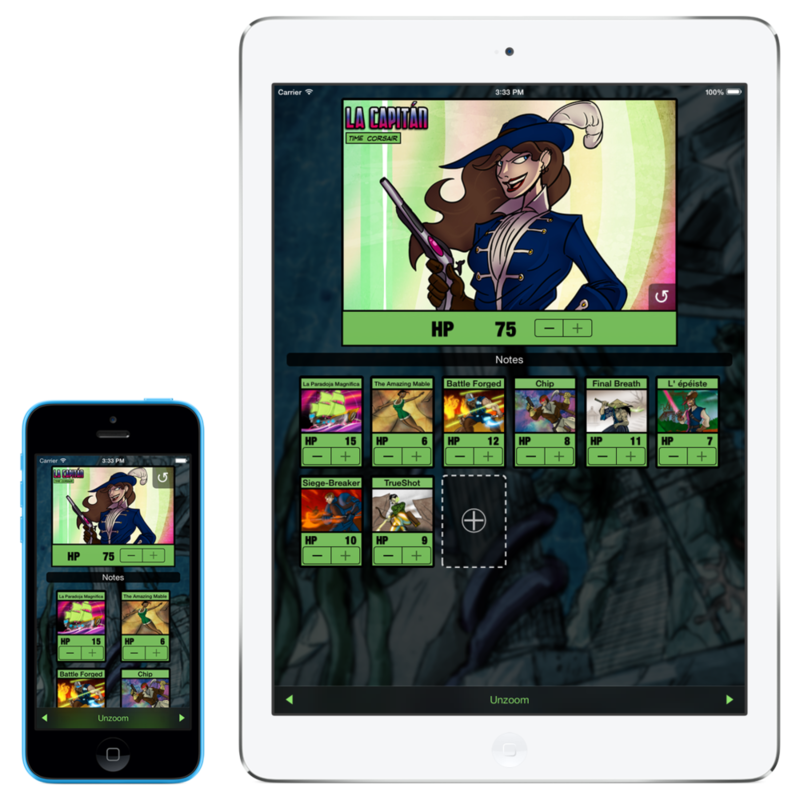 Newly minted copies of Sentinels of the Multiverse are finally flowing again and so it’s time for yet another update to your plucky tabletop companion! The last update saw the introduction of multipeer, allowing up to 8 devices to connect to, and manipulate, the same game at the same time. The feedback we’ve been getting about this feature has been great overall, but one thing we’ve been hearing is that it would be even better if each device could choose to focus on just one character at a time. If I’m playing Legacy, and you’re playing Unity, we’re each really mostly interested in handling our own hitpoints, notes, and targets. Enter the new zoom function! 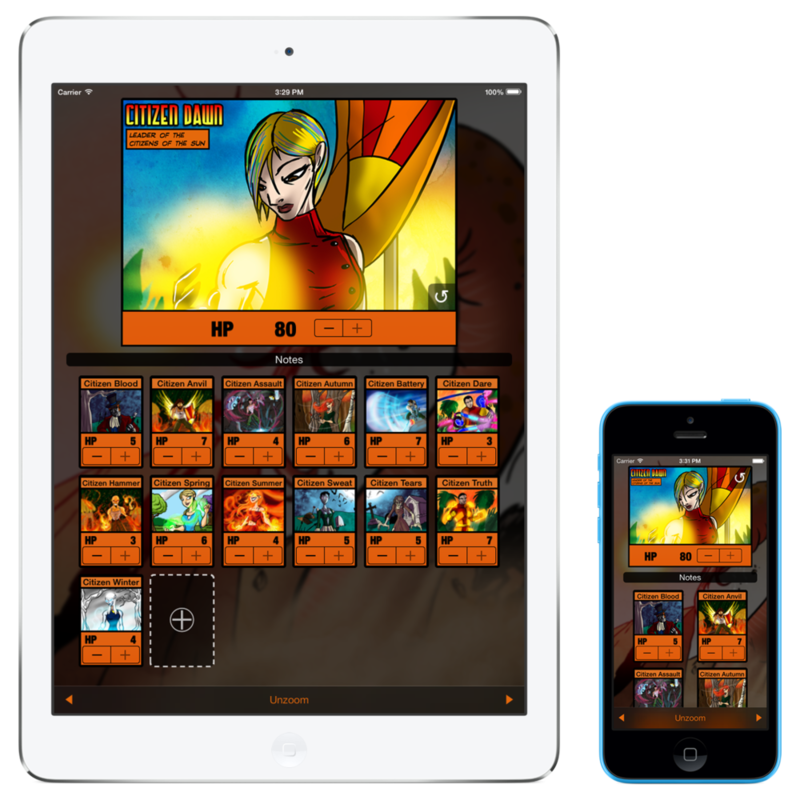 iPad is great for seeing the whole game at a glance, but especially for those of you using iPhone or iPod touch individually while you play, this allows you to zoom into any hero, villain or environment. Aside from keeping the extraneous stuff off the screen, this also lets you see the beautiful game art even better! And speaking of artwork, lots of folks have asked why target cards have been left out of the fun. All the character cards look great and you have told us you love it, so we’re adding support for a target card add-on artwork pack with this version. You can download the Target Card Artwork Pack from the Tools screen. In other news, Sentinels Sidekick now takes advantage of Dynamic Text in iOS 7, automatically using your system settings for text readability for notes and some other UI elements. All of the fonts in Sidekick are now consistent with recommended iOS 7 design. If you are reading this, the update is available now so head to the App Store for this free update to your plucky tabletop companion, and get back to saving the multiverse! We teased it with the last update but it’s time to move from speculation to confirmation - Sentinels Sidekick is (finally?) coming to Android! We’ve been working on it for a while now and while we’re not promising a release date specifically, let’s just say it might be a Merry Christmas for you Android-based, multiverse-savers out there! To be notified when it’s available, or to keep up on all Handelabra Games-related news, just sign up for our mailing list at the bottom of the page and you’ll be among the first to know!